Spinal orthoses, or back braces, can be used for post-operative applications where the spine needs to be supported against excessive motion to protect the surgical repair. In some very specific cases, a spinal orthosis can also be used to support the spine and restrict range of motion when surgical repair is not an option. 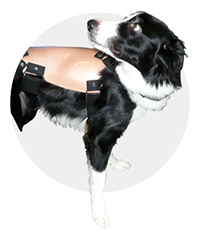 A spinal orthosis is molded from a cast of the dog's back and is made of a fiberglass laminate with a foam liner.